Posted: Thu Sep 27, 2018 18:00 Post subject: Google Ads keep this community free to join! You can see the ground CKP sensor with the O-ring missing. Well, stupid question, but could that have caused the missing and cut off on the motorway? Why do you think the CKP sensor was groung? My own belief is that the previous owner(s) did want to spend money on a new sensor. I was quoted £100 (111 euros) from the local Isuzu. Part no: 8253399140. There are similar sensors advertised as "CAM sensors" from China for as little as £10 or less. What do you think? Are the CAM sensor and CKP sensor the same bits as they do look alike?? ok thats not good that would say it's got an issue with the crank signal which will defo cause it to cut out, the first thing is to try a new crank sensor but if it does it again then it's got to much end float on the crankshaft which is the worn thrust bearings. cam and crank are different so i would bite the bullet and get a genuine one. i think they have ground the wrong bit away you can sometimes shave down the mounting bracket on the sensor so it sits a fraction closer to the timing ring but if you go to far it hits the timing ring thats how close they are. Thanks for this useful info. I'll order the genuine sensor and see how it goes. BTW, can it be found in UK for cheaper money? Cheers! OK, here to update and bring some news about my issue(s)... with the wish that it may help someone out there! So hopefully the starting / cutting / knocking issues are "fixed". 1) I removed and thoroughly cleaned the throttle body. 2) Cleaned the intake throttle position sensor. 3) Cleaned the throttle motor. To clean those, I used a good brand multi spray (can give the name if that's authorised on the forum, as it's not the famous one that first comes to one's mind). Those bits deserved a good clean, I mean it. 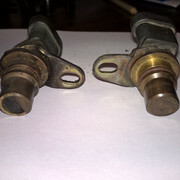 4) Removed the Crank Position Sensor and Camshaft Sensor (please refer to pictures above). 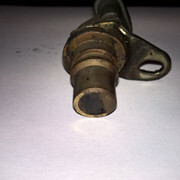 5) Replaced the Crank Position sensor as this was damaged BUT only cleaned the Camshaft sensor. 6) Performed a full service with new 5w30 grade oil and ALL original Isuzu oil filter and subfilter, fuel filter and air filter. Pleased note this proved to be essential, especially for the air filter. I compared the Isuzu air filter with the aftermarket one (not cheap though) I had on, and I could see there is a difference between them. The Isuzu air filter is made in a way to let the system breath, whereas the aftermarket ones are "standard". I beleive the paper folding is too tight, therefore the filter does not allow enough air to get into the system. The folding on the Isuzu filter is wider and I think there must be a reason for this: let air get in freely. 7) Replaced the MAP sensor and the air intake manifold sensor (BTW I have the Euro 3 model). The intake manifold sensor is the one that goes on top of the intake manifold area, next to the dipstick and the injector harness plug. - 31 EGR VSV Circuit. After ahing re-assembled all part, reconnected the batteries and filled the oil, I turned the key and the engine started fine (after being stood for 2 weeks). I left it at iddle for 15 minutes and then turned the engine off to run a new DTC Flash code... And there, BINGO! Only the DTC flash code 34 came up BUT no other codes! Good to mention that the MAP sensor came right through from China and cost me only £8. I wanted to be sure so I cleared the faults by bridging pin 4 and 6 of the OBD terminal. Then, I cleared the fault by disconnecting the ECM fuses and waited for one minute. Then, I started the engine again and let it run at iddle for one hour. The engine was smooth and steady and I even noticed it's not as noisy as it used to be. It even make a good tuned diesel engine sound. Afte that I stopped the engine and the test again, just to be sure. And I can now confirm that the MAP sensor is faulty or something linked to it (harness/connector) althtough they do seem good. BUT thank God no other error codes ever came again. Tomorrow, I will do a test drive and see how it goes. To my opinion, I expect the truck to run perfectly as you can feel the smoothness of the engine when you press the gas through the RPM. No more misses nor cutting or even knocking. NOTE, to remove the Crank Sensor isn't that easy: had to drain the engine oil and remove the main oil filter in order to have access between the antirol bar, the exhaust pipe and the two pipes going to the automtic gearbox. The CKP sits behaind those two pipes. It needs a small flat 10mm spanner, patience, a lot of patience and some back and muscle pain when you finally get it in your hand. Then it needs to be disconnected from it's harness. Job done, hence the full service after you've replaced the sensor. Will update after a test drive. Any question or info you need to know, will be more than happy to help. Sorry for this long post, but I think it may be usefull to explain as much as possible. Unfortunately I couldn't do a test drive today. Engine started well first time. But, damned "check engine" light wouldn't go off. It stayed on and remained on steady. Meanwhile, engine sounds very good at idle speed. Am I missing something? Did a "bridge test" again and only flash code "34" is showing, no other code stored. Turned off the engine. Started again and now check engine light would come on only after pressing the accelerator pedal. on the MIL (“Check Engine” lamp). So could the Chinese MAP sensor be the cause of a check engine "on", but not actually being a problem? Because the engine runs fine, can I just drive the truck like this until I get a OEM MAP sensor? One last thing to mention is the brake light comes on right after I'd press and release the brake pedal. Could that be a vacuum problem and therefore causing a MAP fault? I cannot see any disconnected sensor, or I might be missing the egr pressure sensor? On my trooper, there are two similar sensors. One goes on the right side of the intake manifold and is screwed on it. The other is located under the egr valve, on the left side of the manifold and there is a pipe connected to it. I have actually replaced both of them. 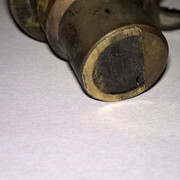 Now, the pipe that is connected to the egr valve itself is obstructed with some bit of metal piece. Is that normal? Thanks! morning! fingers crossed, problem seems to be resolved! changed blocked egr pipe with a new one, check engine light remained "on"
so, basicly, the problem, to my opinion, was coming from a bad CKP sensor (crank angle sensor) and this might be something to look at when having starting issues or engine cutting off intermittently. well, at least before thinking of an orps, because I did have a orps flash code, but this went off after replacing the crank sensor. but remember, i'm not a mechanic, just tried to resolve the issue where no guru was found down here in france to do the job. a big thanks to eithan, i do hope popping around one day as you never forget good people! hope this post will help! Full of useful info. Thanks. When I changed it first time - I did so from underneath using a 10mm socket on several 1/4" drive extenders in order to get the ratchet clear. Doing it that way was not ultra difficult.